A brace of second half goals by club leading scorer Ludovick Takam secured a moral boosting 3-1 win for Pattaya United against mid-table BEC Tero Sasana at the Nongprue Stadium last Sunday evening. The Cameroon hit-man converted a penalty kick in the 58th minute to give the Dolphins a two goal cushion and then pounced on a defensive error five minutes later to seal the points for the home team. 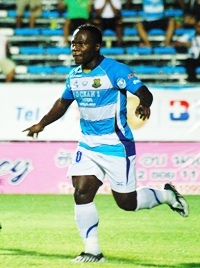 Coming into the match with a run of poor recent form, United started tentatively against their Bangkok opponents and almost conceded a goal in the opening ten minutes when the visitors’ star man Teeratep Winothai, on loan from Belgian outfit Lierse S.K., volleyed just over the bar with a fine left foot effort from the edge of the box. It was somewhat against the run of play when United took the lead in the 17th minute through Anucha Kitpongsri. A short corner kick was played into the path of the diminutive defender and he struck a superb left foot shot on the run that flew past Dorkmaikaew in the BEC goal and in off the post. The goal seemed to settle United and they played out the remainder of the first half without being unduly troubled at the back. Striker Tana Chanabut, enjoying one of his rare starts this season, nearly doubled the lead for the Dolphins just before the break but his header flew just over the bar. There was little in the way of goalmouth action in the second half until United grabbed their decisive second goal on the hour mark. Speedy winger Santi Chaiyaphurk beat the visitors’ offside trap and as he tried to round the keeper, Dorkmaikaew brought him down leaving the referee no option but to award a penalty. Ludovick duly stepped up to dispatch the ball hard to the keeper’s right, giving him no chance to make a save. The Dolphins threw numbers forward following the restart and Ludovick notched his second goal of the match, and his seventeenth of the season, when he brought down Chaiyaphurk’s cross following a defensive lapse and calmly lifted the ball past Dorkmaikaew and into the roof of the net. Ludovick should have completed his hat-trick moments later when Tana laid the ball perfectly into his path just 5 yards out but the African striker somehow managed to miss the goal when it seemed easier to score. BEC immediately went up the other end of the field and nearly pulled a goal back as the unlucky Teeratep saw his shot just graze the foot of the Pattaya post with Narit well beaten. The visitors were eventually able to score a consolation goal in injury time through Brazilian Douglas Cobo as the Pattaya defence for once lost their concentration. The win moved United back up to sixth place in the league as SCG had a free weekend and now trail the Dolphins by two points with a game in hand. 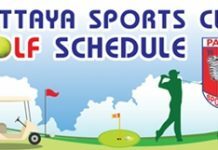 Pattaya will play their final league match of the season this coming Sunday against Sisaket FC at the Nongprue Stadium with kick-off scheduled for 4:30 p.m.
Chonburi FC and Buriram both missed a chance to close the gap on Muang Thong United as they battled to a 2-2 draw at the Chonburi Municipal Stadium last Sunday. With the league leaders not in action last weekend, both teams knew that a win was vital if there were to stand any chance of wrestling the title away from the defending champions. The ‘Sharks’ started the game like they meant business and raced into a 2-0 lead in opening half hour with two goals from Pipob On-mo. However, a second half onslaught by Buriram saw the Isaan outfit draw level with Douglas Gardoza and Kone Seydou getting on the score sheet for the visitors. The draw means that Chonburi can now no longer catch Muang Thong in the league standings and the leaders need only one point from their final two matches to secure back-to-back championships.